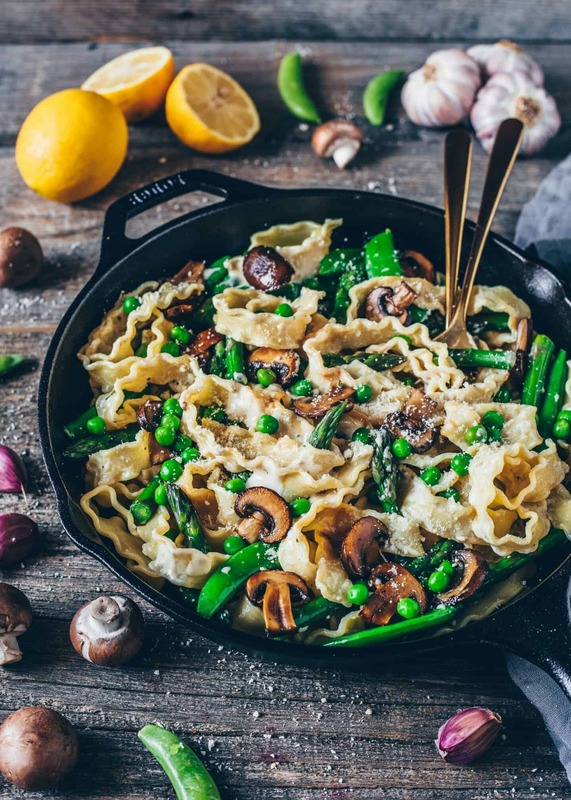 This Pasta Primavera with asparagus, mushrooms, peas and vegan parmesan is a healthy and delicious veggie loaded creamy pasta recipe that is easy to make in under 30 minutes! The perfect dish if you want a quick meal! To me, it’s all about enjoying pasta! I mean, you can never go wrong with pasta, right? 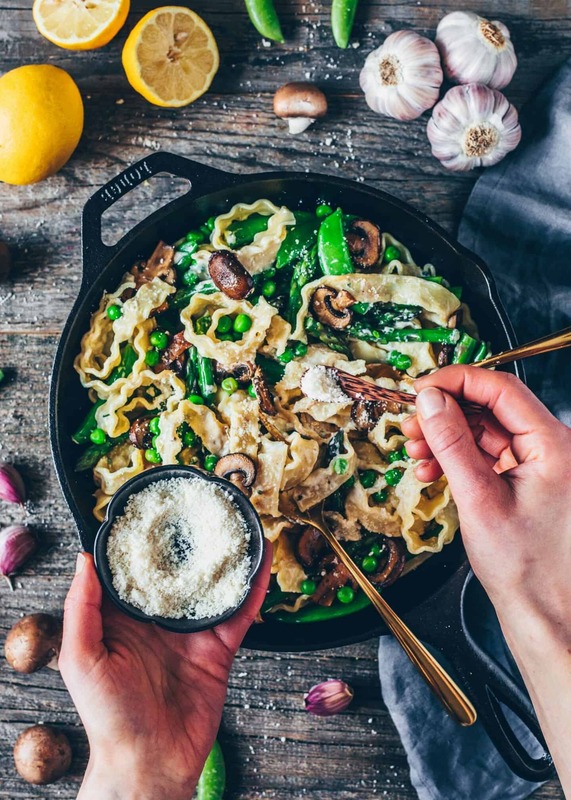 Pasta dishes are not only super easy to make, but also very delicious and satisfying! So it’s always perfect! Especially, when it’s also loaded with healthy vegetables and tossed in a creamy sauce, I could eat it every day. 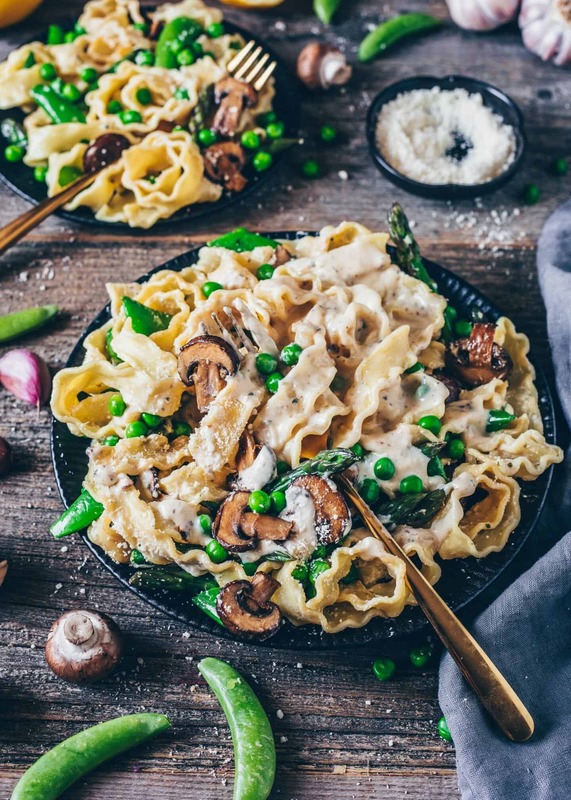 Since my creamy Vegan Carbonara was so delicious, I wanted to make an equally fast recipe but without using cashews to make the sauce. So I kept it a little easier this time because you don’t need to soak or cook any cashews in advance. Also, I added more veggies because, you guys know, vegetables are healthy! 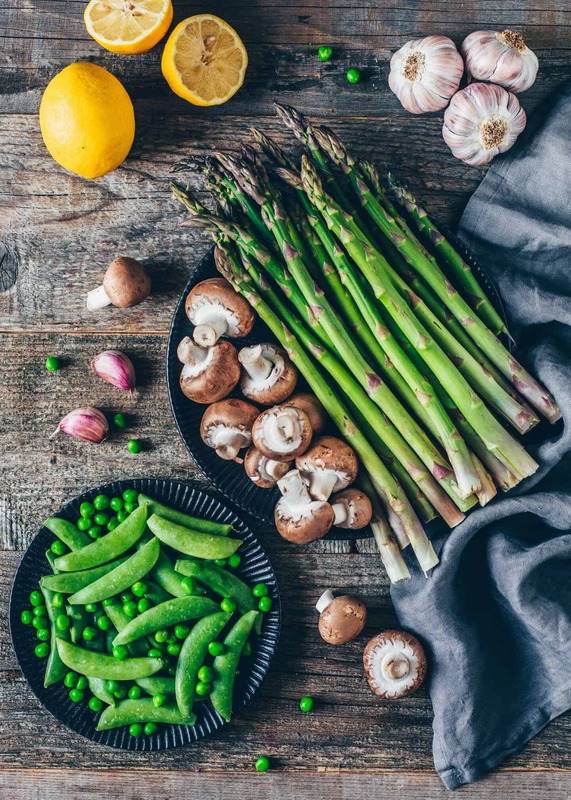 Next to Asparagus, I have also added sugar snaps, peas, and mushrooms which makes a perfect combination. I really love the sweetness from the sugar snaps and peas, along with the meaty mushrooms and flavorful asparagus. And the great thing about it is that none of the veggies require a long cooking time. You can simply sauté them all together in a pan for a few minutes until tender. 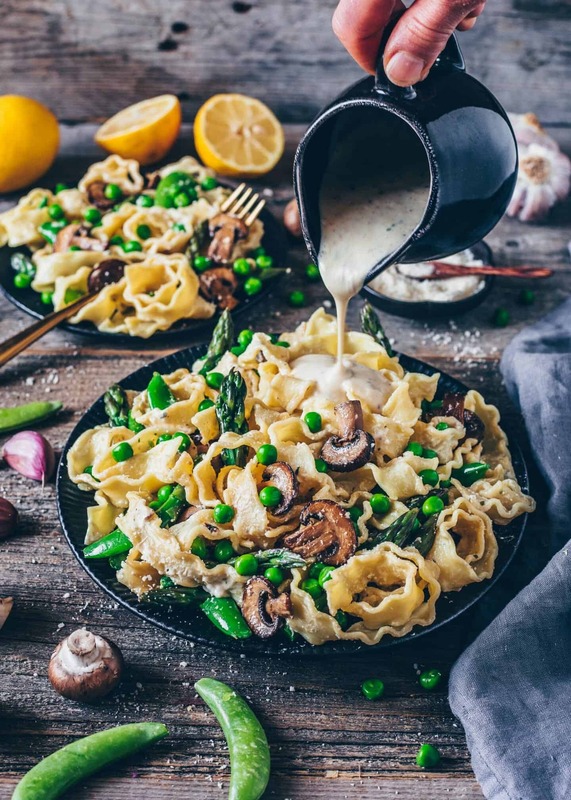 The sauce for this pasta primavera is super easy and it takes all of 5 minutes to prepare! It is made with non-dairy milk and a bit of vegan cream cheese, as well as garlic and spices for a tasty flavor. As I mentioned before, it’s actually like a simpler version of my vegan carbonara. So it’s a nice change up, but you can, of course, also make the sauce with cashews if you can’t find non-dairy cream cheese. 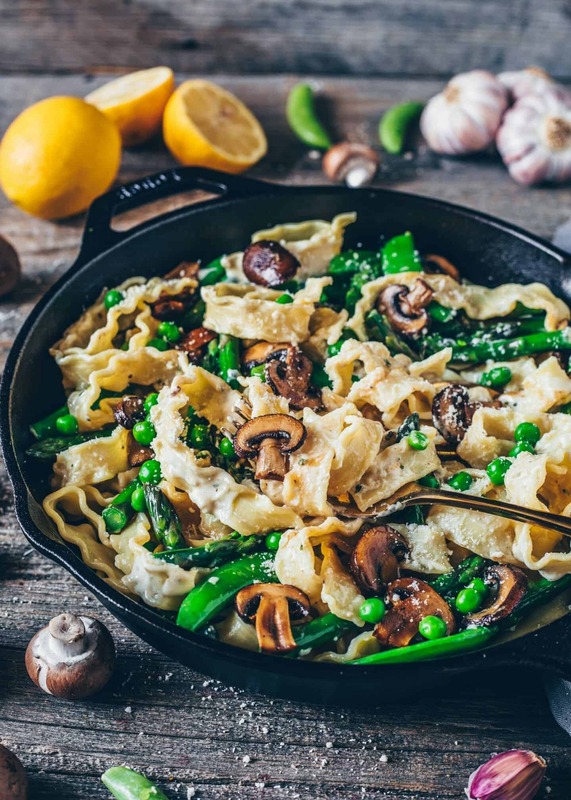 While you sauté your veggies and prepare the sauce, you can also cook your pasta. Then your entire dish will be ready in under 30 minutes! 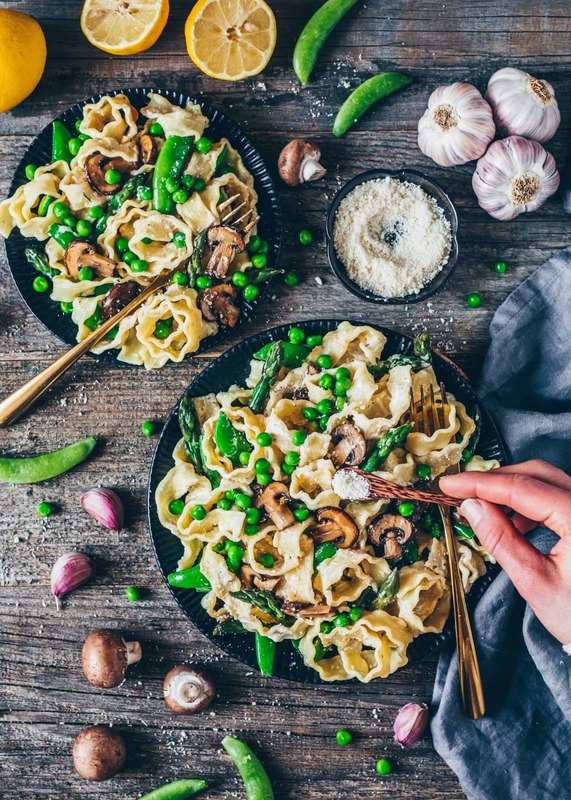 Once your pasta is al dente, simply toss everything together, season to taste, and serve! I also topped my dish with homemade vegan parmesan cheese which is also easy to make and tastes so delicious! 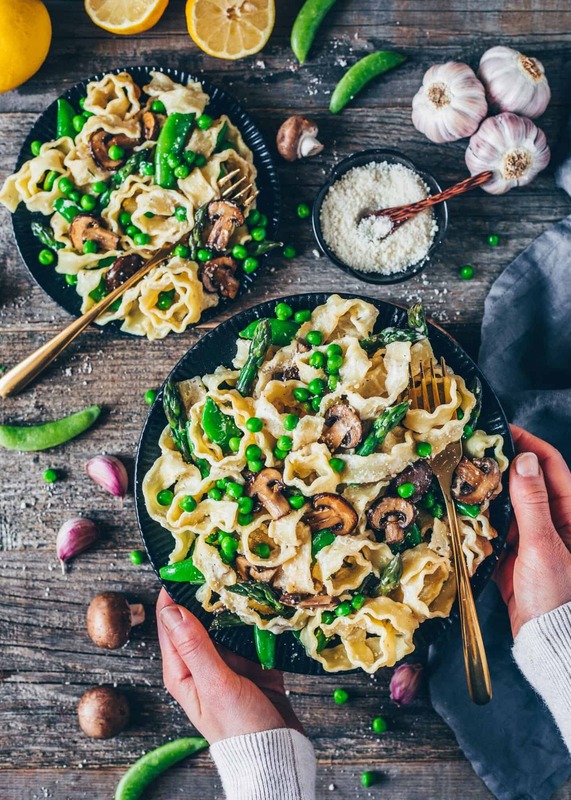 I’ve already made it very often because this vegan parmesan is absolutely perfect on top of any dish, such as pasta, gnocchi, pizza or other foods. Basically, all you need are nuts, salt, and nutritional yeast. Simply add everything into a food processor, then pulse and mix until you have vegan parmesan. That’s really easy, right? 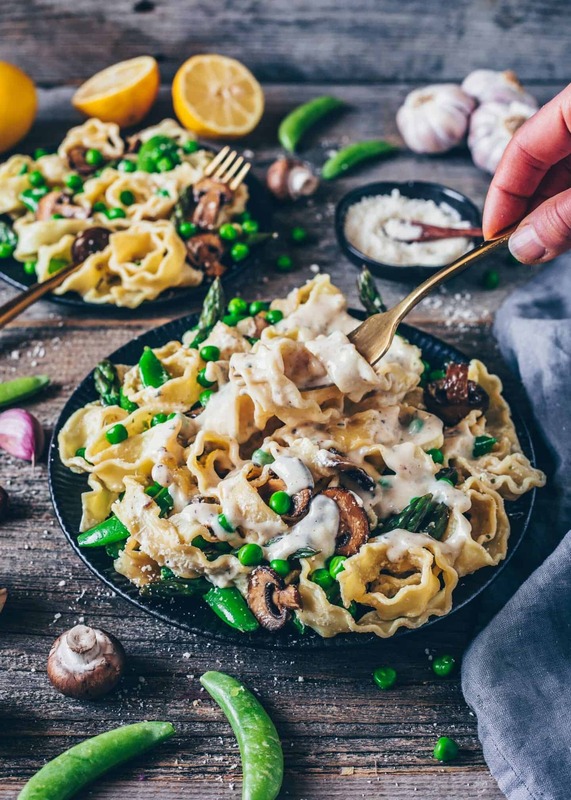 This easy creamy asparagus and mushroom pasta is perfect if you want a quick lunch or dinner that is healthy and delicious! 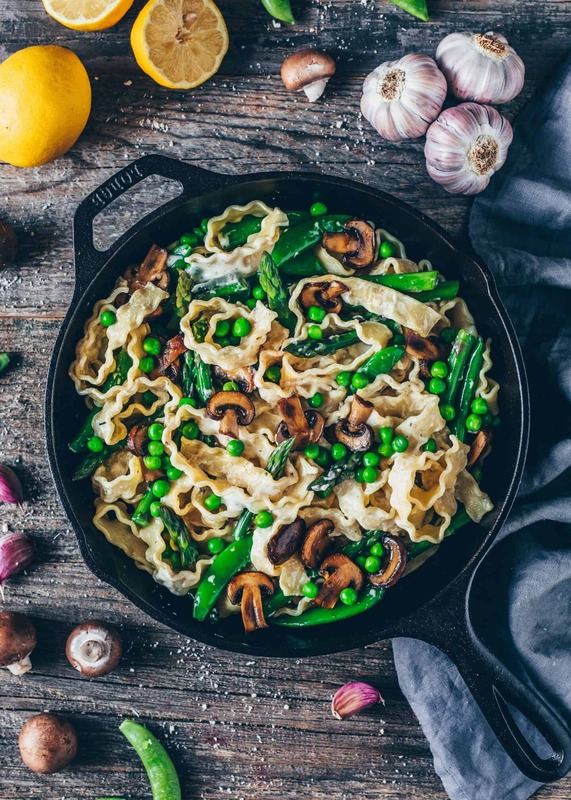 You can cook this Pasta Primavera recipe anytime because you can add any vegetables that you like or that are in season. 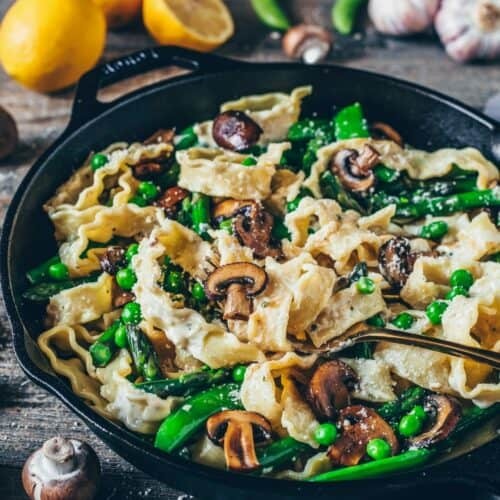 When asparagus is not available, you can also just add more mushrooms or serve the sauce with just the pasta. Add all ingredients to a food processor and mix/pulse until you have a parmesan-like consistency. Store in the refrigerator for up to 2 weeks. Cook the pasta according to the package instructions until al dente. Then drain. While the pasta is cooking, prepare the vegetables and sauce. 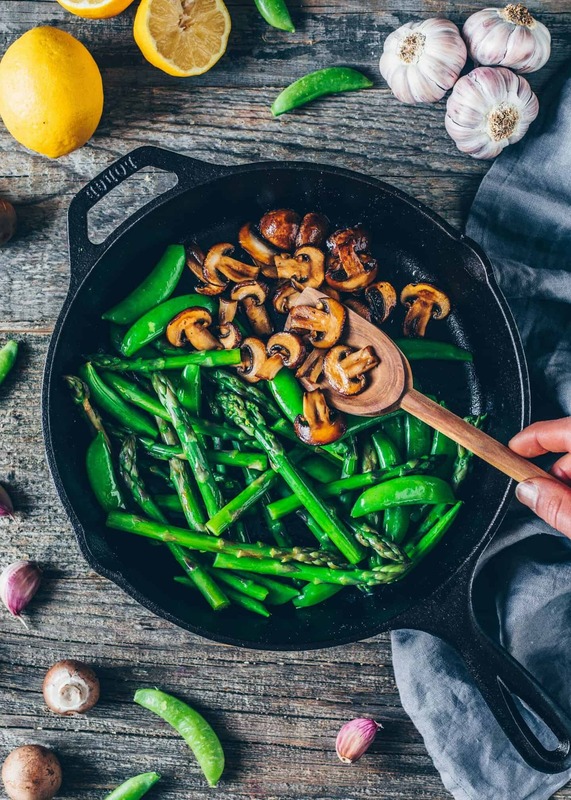 Heat 1 tbsp of oil in a pan over medium heat and sauté the mushrooms, sugar snaps and asparagus until tender, about 5-7 minutes. Remove from the pan and set aside. Heat another tbsp of oil in the pan. Add the garlic and sauté for a minute until fragrant. Add the flour and non-dairy milk and whisk to combine. Bring to a boil and cook for 1-2 minutes, or until thickened. Reduce the heat and stir in the cream cheese and vegan parmesan (or nutritional yeast). Season with salt and pepper to taste. Add pasta and vegetables to the sauce and toss to combine. (If the sauce is too thick, add a bit more non-dairy milk, or cook it longer, if it is too thin). 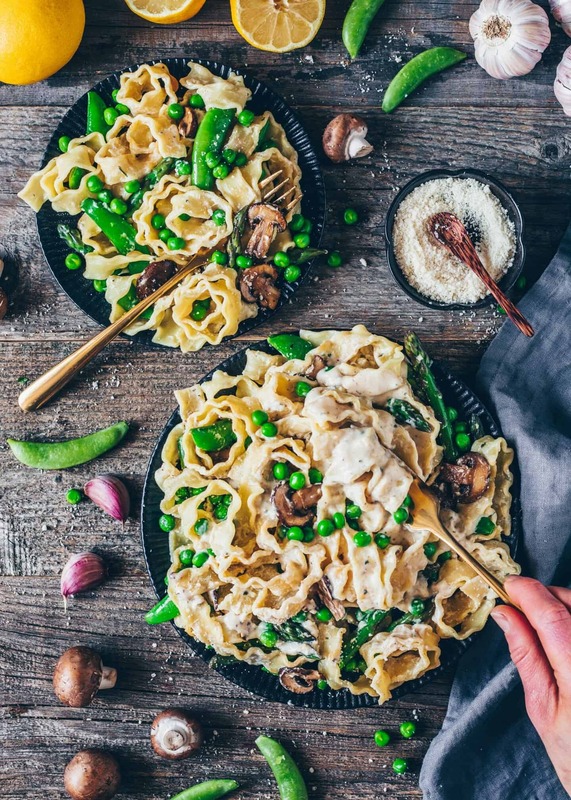 To make this recipe gluten-free, you can use gluten-free pasta and gluten-free flour. I used black salt for the sauce which adds an eggy flavor, but any salt is fine. You can also add any veggies you choose. 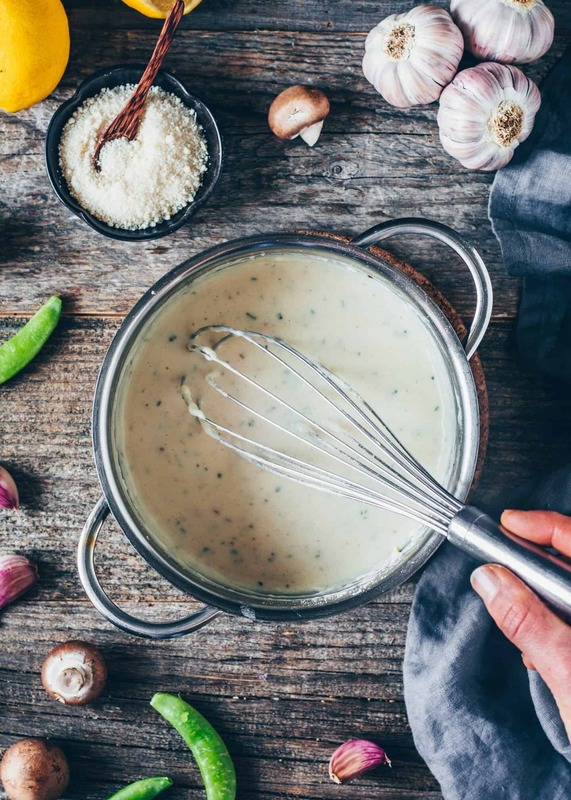 Instead of non-dairy cream cheese, you can use blended soaked cashews or store-bought cashew butter to make a cashew cream sauce (click here for the recipe). Also, omit the flour, or the sauce will be too thick. You can make the vegan parmesan with any nuts of choice. Your photography amazes me everytime, Bianca! It’s so so beautiful. 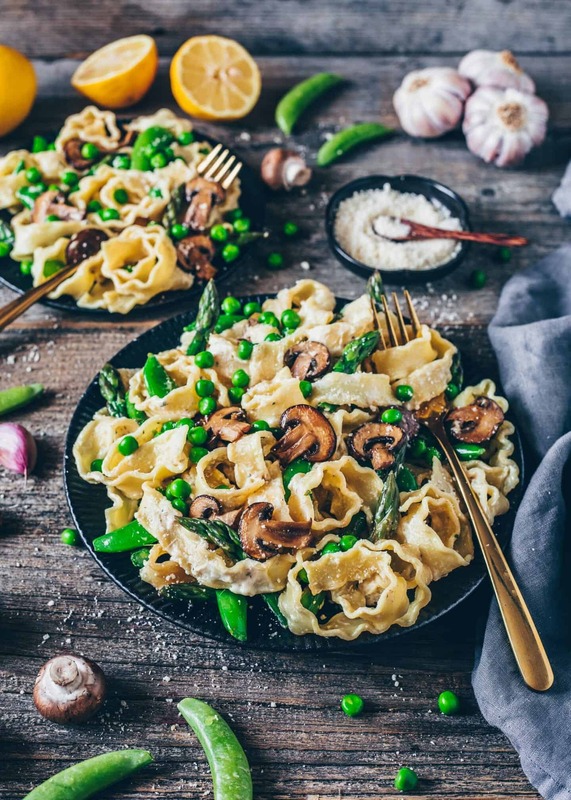 This pasta recipe sounds delicious, I’ve never tried asparagus with pasta!